LAS VEGAS, Nev. – Roy Hawk capped off a great past month for his family on Wednesday in the desert outside of Las Vegas. After competing in the 2015 Forrest Wood Cup, and watching his son, Sunny, win the co-angler title there, Hawk crested the peak of a mountain of his own he has been close to reaching the summit before when he claimed victory in the 2015 WON Bass Nitro / Mercury U.S. Open. Hawk began the final day of the event less than half a pound behind the leader; however, the consistency of his weights made many believe that he held the inside track to win. Then the final day started, and Hawk went fishless until after 11 o'clock in the morning. His final day weight of 8.75 pounds brought his total winning weight to 29.40 pounds. "I really wasn't getting too uptight because I had a better bite in the afternoon on most of my practice days," he said. "The only thought that kept going through my head was that I had lost one of the events in the past because I tried to force a reaction bite that wasn't there; so, I scaled down and finesse fished until I couldn't stand it anymore after the morning went slowly." That approach only presented a single keeper that his AAA partner caught at 11:15. "I tried it for a little while after that, and then went back to my primary areas, and started getting bites," he said. "I had a double hookup on my topwater bait that gave us fish number two and three, and then managed to catch a few more on the topwater and a jig to fill out the limit a cull a couple." He reported heading back towards Callville Bay for weigh-in without much anticipation. "I really felt like I had left the door open once again, and really didn't have much chance of winning," he said. "I thought the only chance I had was if other anglers struggled too, and that happened today. I can't believe I won the U.S. Open, I am completely blessed." Hawk said that he spent his whole practice period and tournament fishing the lower basin near the dam, Hemmingway Harbor and Kingman Wash. He reported fishing a team tournament a few weeks ago that showed him there was potential in the area. "I never went anywhere else to practice because I felt so good about it, and I spent my whole tournament in the lower basin in sight of the entrance to the dam." Hawk said three lures were responsible for his win. The primary lure, which allowed him to target shad-chasing bass that would occasionally school, was a Duo Realis Pencil topwater lure. He said a few were produced on a SPRO crankbait as well as a Yamamoto football jig and double-tailed grub trailer. 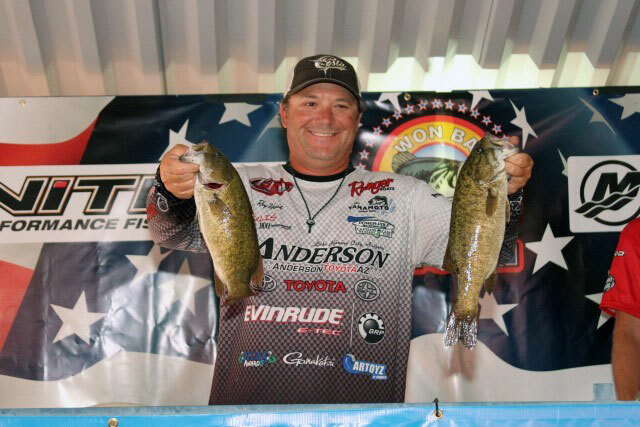 For his victory, Hawk will earn the keys to a U.S. Open themed red, white and blue 2015 Nitro Z8 bass boat and Mercury ProXS 200 outboard valued at nearly $40,000 and an additional $50,500 in cash, bringing his total winner's purse to nearly $100,000. Clayton Meyer, of Henderson, Nev., like most of the field, struggled to produce the consistent weight he had the previous two days. However, his 7.53-pound limit on day three brought his total weight to 27.43 pounds; enough for second place for the event. "I never really felt like I had a chance to win at any point during the day because I didn't do enough on the water today," he said. "I can't say that I am disappointed because I really did all I could, I just never really got the kind of bite that would have made the difference today. As it is, Roy (Hawk) won by a big margin for Lake Mead (nearly two pounds) and a $20,000 payday for second place is a pretty big deal." Lake Havasu, Ariz., pro Shaun Bailey caught the big bass of the tournament on the final day; a 4.56-pound largemouth he reported catching on a jig. On the amateur side, Tyler Rempe of Sierra Vista, Ariz., was a part of the big day with his pro partner Ben Grande on day two that helped him take the lead on the AAA side. He came to the scales with 9.50 pounds on the final day and held on to the lead he grasped on day two, winning with a total weight of 29.75 pounds. He managed to withstand the charge of Phoenix, Ariz., AAA Tim Demecs, who finished the event with 28.43 pounds. To view 2015 U.S. Open Pro Final Standings, click here. To view 2015 U.S. Open AAA Final Standings, click here.